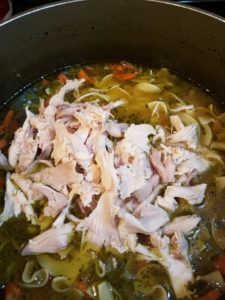 Homemade Chicken Soup just like Grandma’s! 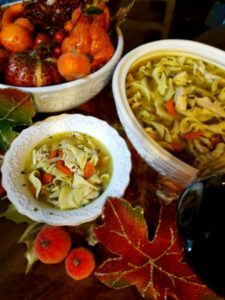 Autumn is full of cool, rainy and windy days that seem go hand in hand with craving a comforting bowl of warm homemade soup, and chicken noodle soup is one that always hits the spot! It leaves the house smelling delicious and is so easy to make. Chicken soup that is warm comforting is perfect for any fall day! One of my earliest memories is going to my grandma’s house and smelling the comforting scents of a nice pot of hearty chicken soup simmering on the stove. She filled it a fresh chicken from the farm, loads of garden fresh vegetables and herbs. She even made the noodles from scratch. The longer it simmered the more heavenly flavor it had. In today’s busy world, it is far easier to open a can of soup from the store, but unfortunately most canned soups are filled with sodium, and unnecessary and “unhealthy” additives such as MSG. Who wants soggy vegetables and bland flavor that just cannot compare to a pot of fresh, steaming homemade soup? A couple years ago I wanted to make a recipe book filled with all of family favorites, including several of my great-great-grandma’s recipes, for my oldest daughter who was just setting out on her own. While working on this project, I came across the recipe I remember so well from when I was young. And wow, I couldn’t believe how easy it was! Better yet, if you don’t have all day to simmer a nice pot of soup, this recipe can be ready in as little as 1 ½ – 2 hours. If you have leftover chicken in the refrigerator, or if you pre-cut the veggies the night before, it can be done in even less time. 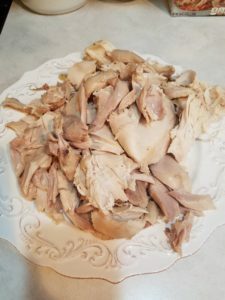 You will want to make sure you are using a whole fryer chicken and a good quality chicken broth, with homemade touches – it really does make a huge difference in the flavor. One of the best things about this recipe is that it is easy to modify for personal tastes. For instance, I love fresh rosemary, so I add twice the amount as the recipe calls for. And if you like creamy soups, I have added some optional steps for a nice thick soup! 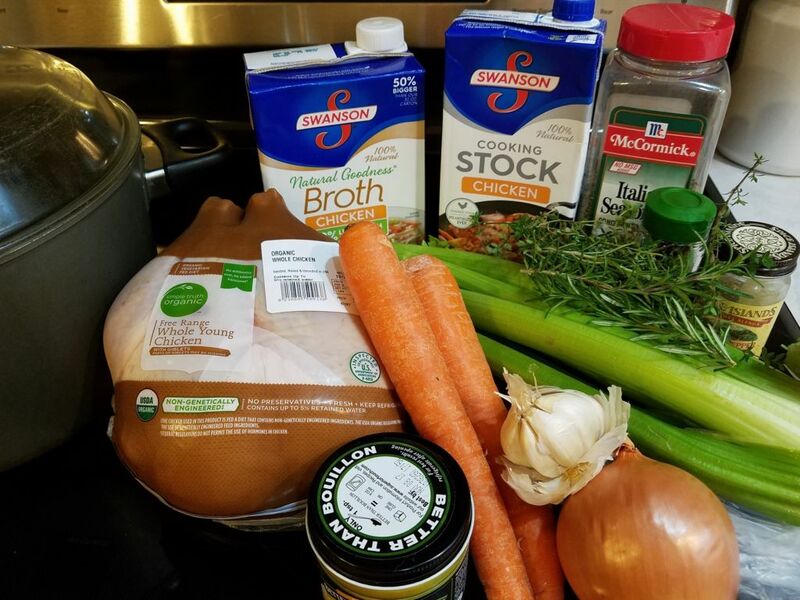 Fresh herbs and vegetables with a high quality chicken and broth make for a more flavor soup. Personally, I like to make this when I can spend the day at home and enjoy the smell of the broth simmering all day. I also like to set it aside after the noodles are almost done and the chicken has been added. This way, they can soak up the flavor of the broth fully. The noodles will soak up the broth like a sponge, so you’ll want to make sure you have lots of broth in the pot! This recipe quickly became one of the favorites in my family and is one of our most requested meals. It has the added bonus of making heavenly leftovers, after all the flavors have blended even more; just make sure to have extra chicken stock on hand since the noodles will continue to soak up the broth. Rinse chicken well and add to large dutch oven. Add chicken innards to pot as well. 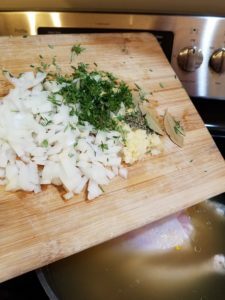 Add chicken broth until chicken is just covered. 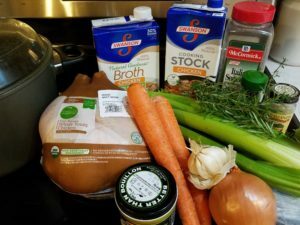 Add all remaining ingredients to broth. Bring to boil and boil approximately 30 minutes until chicken is done. 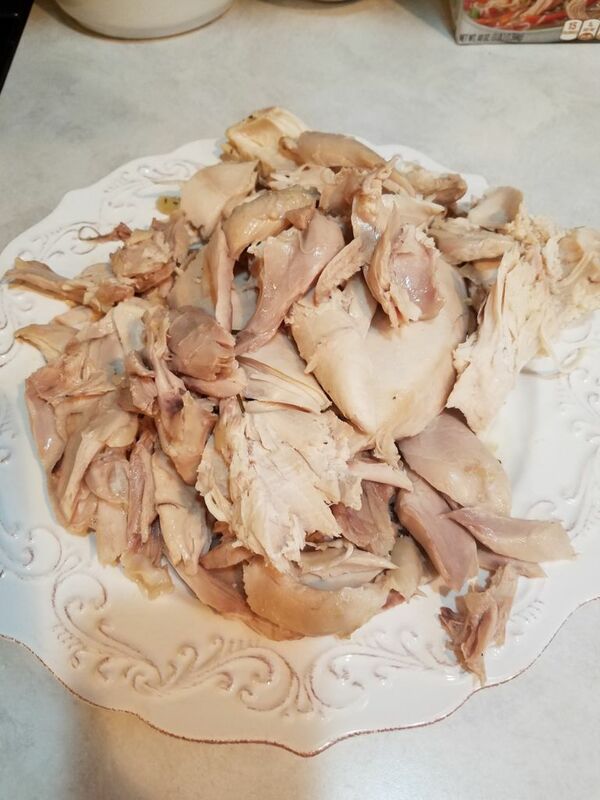 Remove chicken to a plate to cool. Discard the chicken innards. Once cool, debone chicken. Drain onion and bay leaves from broth and discard. 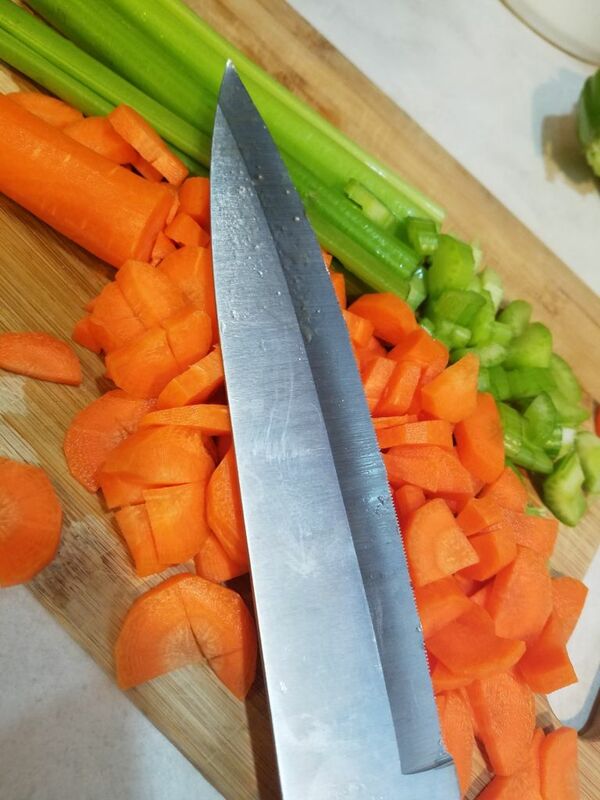 While chicken is cooking, chop carrots, celery and herbs; set aside. After stock is done, bring back to slight boil. Add cooking sherry and fresh herbs; simmer for 3-4 minutes. Add chopped carrots and celery; simmer for 5 minutes. 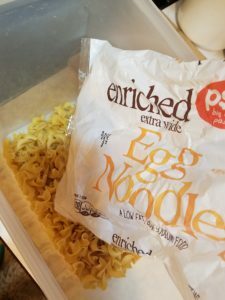 Add egg noodles and cook per package instructions. 5 minutes into cooking noodles, add chicken pieces. Continue to simmer until noodles done. If you desire a fuller flavor, remove from heat before noodles are fully tender. Let sit for 15-20 minutes for flavor to soak into noodles and chicken. You may need to add additional stock.